Hopelessly Devoted Bibliophile: An Interview with Poseidon, plus take home a copy of MEDUSA THE MEAN! An Interview with Poseidon, plus take home a copy of MEDUSA THE MEAN! Please welcome once again, the lovely Joan Holub and Suzanne Williams to the blog! If you haven't been around my blog very long, you might not know that I am a huge fan of their Goddess Girls' series. From book one I've been drawn in by the total cute package. What better way to enjoy Greek mythology? Put these in a middle grade reader's hands, and I guarantee they'll fall in love. Today it is all about the newest book in the series, Medusa the Mean. 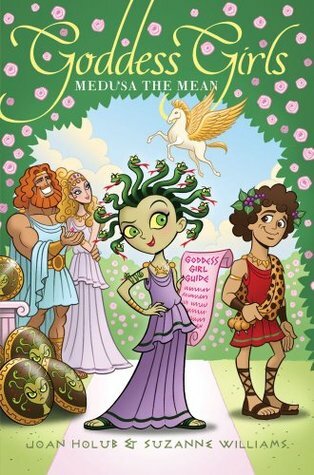 Medusa is the ultimate mean girl in this series that blends modern drama with ancient myths.Well researched and true to the original myths, each volume in the Goddess Girls series addresses contemporary issues, like friendships and relationships, from a classically accurate—and entertaining—perspective. In Medusa the Mean, Medusa is sick and tired of being the only mortal at Mount Olympus Academy. Not only is she surrounded by beautiful, powerful, immortal classmates, but she also has snakes for hair and a reputation for being mean. Immortality, she thinks, will solve everything. So when she finds out about a necklace that promises just that, she’s sure it will help her get the two things she covets most: to be as popular as the four Goddess Girls and to have her supercrush, Poseidon, finally notice her. But when the necklace brings about popularity in the totally wrong way, things go from bad to worse. Can Medusa overcome her “meanie” status and prove that there’s more to her that meets the eye? I'm lucky enough to have the apple of Medusa's eye, the ever hunky Poseidon here for an interview! Let's let him tell you a little about himself and Medusa, and show you further why you need to read these books. 1) If you had to choose just one word to describe yourself, what would it be and why? Awesome. A for, well, awesome. W for wow. E for epic. S for sea god. O for Oh! Isn’t Poseidon cute? M for muscles. E for my dreamy sea-green eyes. 2) What would you say is the best part about being you? The worst part? The best part is that I’m god of the sea. The worst part is that Medusa seems to think that gives us something in common. But just because her mom is a sea monster and her dad is a sea hog—that doesn’t mean I’m going to take a girl with snake hair to Principal Zeus’s wedding! 3) How would you describe Medusa? Snakey. Did you know she actually feeds that hair of hers? I mean, really, who has snake hair? At least they’re vegetarians. 4) Do you have a best friend at the academy? My best bud is Apollo. He’s in my band Heaven’s Above. I’m sure you’ve heard of us. 5) What is one wish that you hope will come true? That I will be able to one day best that brainy Athena. Before she came to Mount Olympus Academy, I was a shoo-in to win the invention fair. I mean, my water park was awesome. But for some reason, those mortals in Greece chose her olive tree over my water park and named Athens after her. I want a re-match. It should have been the city of Poseidonia, Greece! and puts a modern spin on classic Greek myths. Up for grabs is a signed copy of Medusa the Mean just for you! Joan and Suzanne always put some swag in their books too, so chances are you'll get some bookmarks ;). Enjoy!